I'm a fan of Yoshi, Parakoopa (duh), Fawful, Prince Peasley (no, I'm not a fangirl; I envy his flying bean! o_0) and Kirby. You can also find me on Wikipedia (as Homeschool Winner) and the Homestar Runner Wiki (as Stongbah). I'm an expert in Wikicode and CSS. Expect more edits soon! Yoshi and Parakoopa. Teh Best. File:Wii small.jpg This user prefers the Nintendo Wii over the Xbox 360 and the PlayStation 3. This user plays the Virtual Console! This user loves the Mario & Luigi Series. 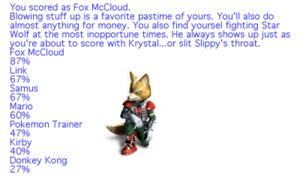 57px This user thinks the best Super Smash Bros. character is Lucario. This user is a big fan of the Nintendo character Yoshi or any kind of Yoshi. 57px This user is a big fan of the Nintendo character Fawful. This user is a fan of the Nintendo character Prince Peasley. File:Waluigi Head Small.PNG This user is a fan of the Nintendo character Waluigi. This user strongly dislikes Microsoft. Whoo, Nintendo! Whoo, Macintosh! This user unfortunately does not like Sony, however he would like Sony more if they made better prices on game systems and DVD players. MWPP This user is still part of the Super Mario Wikify PipeProject. File:Mario Head Small.PNG This user plays the Super Mario 3D series. FF This user plays the Final Fantasy series. This user has Paper Mario: The Thousand-Year Door and named his black Yoshi, Gonzales. This user thinks Waluigi should have his own game. What I'm doing, or will be doing. Which Neglected Character Are You? What Obscure Donkey Kong Character Are You? This page was last edited on February 25, 2009, at 22:29.